Stencil card (aka ‘stencil paper’ or ‘oiled manilla’) is a strong thin card treated with linseed oil which makes it even stronger and partially waterproof. This also stops it from ‘furring’ .. that is, cut edges stay quite sharp even if handled a lot. All this makes it ideal for the creation of small-scale, intricate forms especially furniture. It has quite a pleasing ‘wood’ colour as it is, but it will also accept woodstain or paint very well, even water-based such as ink or acrylic. It can also be scraped with sandpaper to give it the appearance of wood and this will be enhanced by staining (see below). 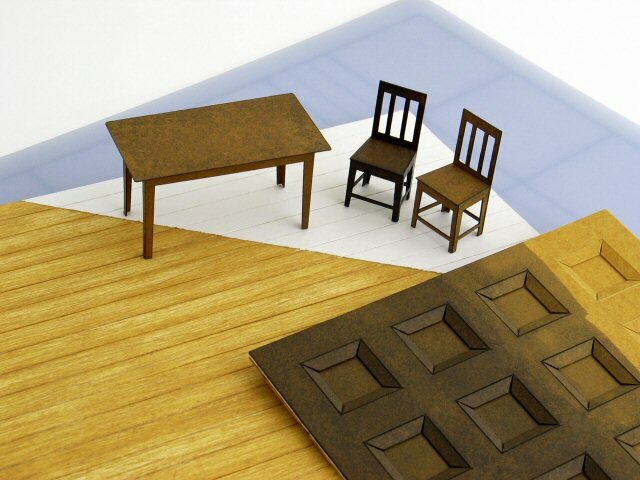 Below is a method I’ve developed for making many forms of furniture, principally chairs but also cupboards and even tables, and best suited for 1:25 scale. The most suitable stencil card is the thicker version (375 microns). A double thickness of this will be used. For a start, I always draw plans for furniture first in a larger scale such as 1:10 on an A4 sheet (easier to design and draw) then reduce on the photocopier (40% to scale from 1:10 to 1:25). It means I can use the same template/design again in the future. The drawing should lay the parts of the furniture out as if ‘flat pack’ ready for building. Remember that in designing this you have to take account of the final thickness of the card which will be aprox. 800 microns, in other words 0.8mm. First you spraymount your 1:25 paper template onto the stencil card (shown at the top of the photo below). Use the permanent type of spraymount and spray a light covering .. never thick. Test the fixing of the paper template by trying to move it around. It should be stuck fast almost immediately, if not you’ve used too much spraymount and you need to wait a little longer. If stuck fast you can begin cutting. I recommend using a Swann Morton scalpel (No 3 handle) with a 10A blade for all intricate cutting. Work from the centre outwards, cutting the interior parts first before cutting the outline and removing the piece. Having a small (15cm) metal ruler for this kind of work is very helpful. The first pass with the knife (when cutting anything except thin paper) should just be a guiding score to establish the position of the cut, without a lot of pressure. You’ll find the groove again with the knife point on the second pass and this time you can press harder. When all the pieces are cut out glue them back onto another piece of stencil card with the drawing side down (shown on the left above). You can use spraymount again if you wish but thinly spread Pva will also work for these small pieces. 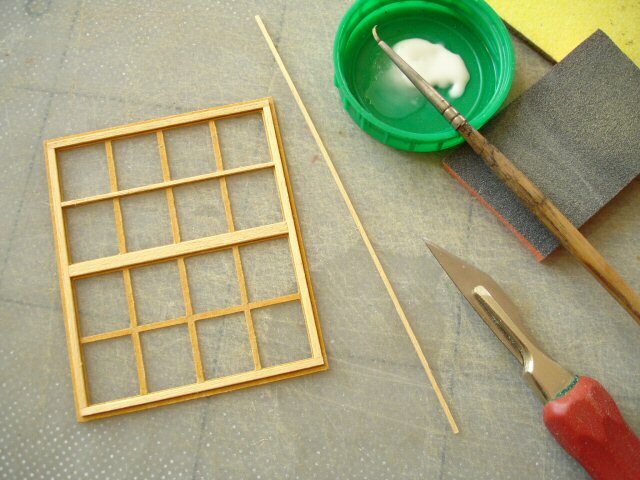 If using Pva it is best to lightly scour the stencil card surface with fine sandpaper to give a better key for the glue. Test again that the pieces are firmly stuck and now you can cut around them using the raised edge as a guide. Cutting through the second layer of stencil card will be a little easier this time because the first layer guides the knife. As a general tip, intricate cutting is always made a bit easier if you first do a rough cut fairly close (aprox 1-2mm) outside the line. When you cut on the proper line the material parts better because it has somewhere to move to. I would recommend using superglue to fix the furniture parts together properly once you have cut them. Pva glue (especially a good wood glue such as Evo Stik) will work fairly well but will not bond as strongly. Edges may need two careful applications of superglue because the first tends to soak in too quickly. I’ve managed quite good results with the method of cutting/scoring/bending single thickness stencil paper. For example the legs of these chairs above and of the table following were drawn out as a continuous strip, cut out and carefully scored with a scalpel to bend them at the corners. By these means one can create a slender scale form which is reasonably strong and fairly convincing looking, if not totally ‘realistic’ (photo Astrid Baerndal). In the photo below the heavy panelling surface was created mainly by scoring/bending. 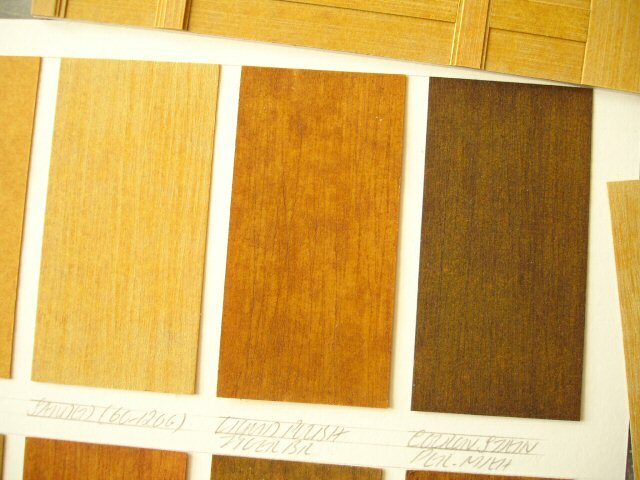 Here the forms have been darkened using spirit-based woodstain. Water-based media, including acrylic painted or rubbed in thinly will also work but there will be some warping of large flat surfaces. It’s best to let these dry and then carefully bend them straight again and even better if this can be done before assembling (photo Astrid Baerndal). 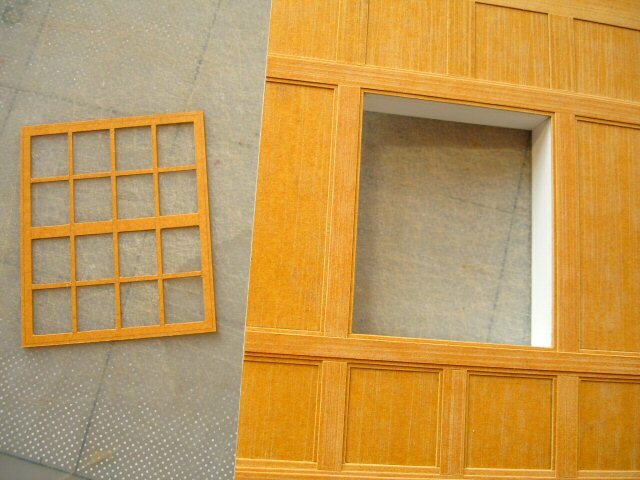 Below is a very convenient way of creating louvre shutters, also by cutting/bending, although it may need some practise! I’ve cut horizontal slits in the card and carefully made a further ‘nick’ with the knife above each slit either side, so that the slats end up quite slenderly attached. The slats can then be forced to bend, best done by inserting a small metal ruler and tilting upwards. These can be quite fragile left as they are but can be strengthened by placing spots of Pva glue on the back face where they attach (photo Astrid Baerndal). I recently tested whether I could give the stencil paper a woodgrain look by firmly scraping with sandpaper (c. 120 grit best) and this worked even better than I’d imagined. Normally sanding card wouldn’t do much more than ‘fuzz up’ the surface but because of the hardened linseed oil treatment the surface scratches rather like soft plastic. 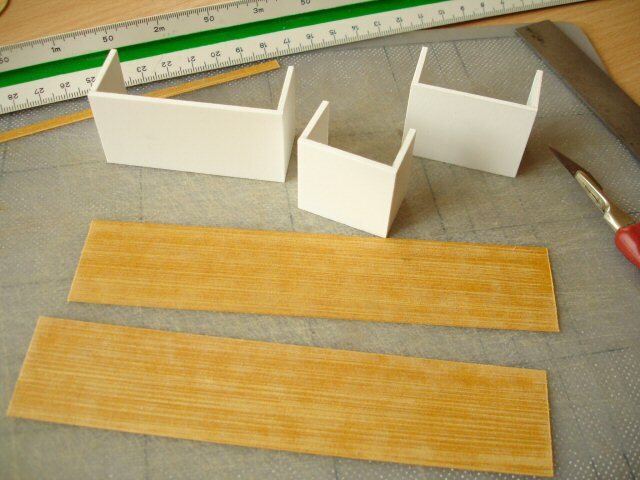 For these cupboards I prepared sanded strips which were then used to clad boxes made in PVC. More detail can then be added using small strips. Spots of superglue had to be used to stick card to plastic. The cupboards here are ready for staining. In addition to commercial woodstains, liquid shoe polish works well as a stain and will include some shine if more than one coat is applied. A cheaper alternative to buying woodstain is to dissolve a suitable colour of oil pastel or even solid shoe polish in white spirit. Tests always need to be made first and below is part of a collection of colour swatches. To the left is a scraped but unpainted sample next to two which have been stained with liquid shoe polish and a stronger commercial stain. I’ve developed the technique of graining the surface mainly as an easier way to convey panelling or floorboards on a small scale, for which I would first prepare a large piece and then cut into strips following the grain. In trying the grained surface when making the chairs or table components above it’s important that the grain doesn’t noticeably go in the wrong direction, which it will in the case of some cutouts. It may be better to scrape pieces carefully once they have been cut out, varying the direction. Below is a piece of panelled wall in preparation with the first stage of the window structure. Stencil paper is the ideal material for managing a fine, controlled cut-out which can then be added to on top to give it more strength and profile. Here I am adding very thinly cut strips of 0.8mm obeche wood to the stencil card using slightly thinned PVA applied with a brush. This is certainly delicate work, but not half as painstaking as it would be if the stencil card template wasn’t there to keep everything in its right place. The combination is also surprisingly strong! 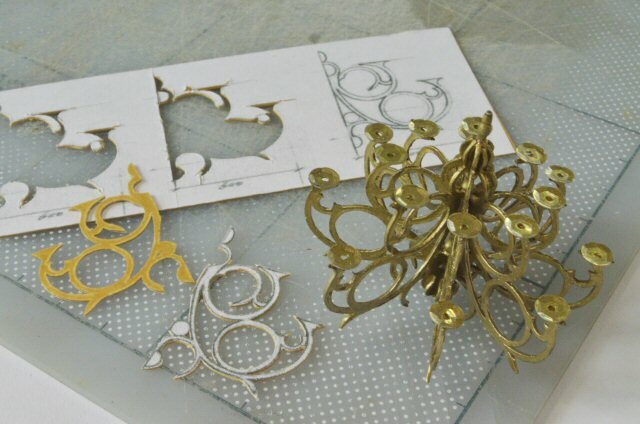 Lastly, making cut-outs in stencil card offered me a way of tackling the intricacy and regular symmetry of this brass chandelier form, although it is by no means a perfectly easy and quick solution. Each segment is carefully cut from a single card layer and superglued to a central styrene rod. Sequins happened to work well for the candle saucers and the rest was painted with a fine-tipped gold Edding pen. Oiled manilla stencil card is fairly common to UK art/craft shops and online, and I’m guessing that in most cases this is in the form distributed (though not manufactured by) Winsor & Newton. It has been very difficult to trace who actually makes it .. but recently with the help of comments posted here we’ve been able to narrow it down to Grantham Manufacturing Ltd, a specialist packaging paper manufacturer in Lincolnshire. I include this just for information because they don’t sell it directly themselves. The regular art shops sell it at quite a high price, averaging £4-5 per 760x500mm sheet, presumably because they have to add on Winsor & Newton’s mark-up. But there are other sources, specifically gilding/restoration specialists such as Wrights of Lymm or A. S. Handover in London who offer it far cheaper in a larger format 1000x600mm. I’d always assumed it was produced as an art/craft material but I’m beginning to realise it’s another of those things that has become appropriated by the art/craft market but ‘makes its living’ elsewhere. Machine-cut stencils are still used, particularly in the shipping industry, for quick tagging of goods and oil board is produced mainly for this purpose. The oil in this case not only protects the stencils from water-based paint or ink (meaning that they can be used over again) but acts as a lubricant for the stencilling machines. So far I’ve just dealt with the US in terms of ‘abroad’ because almost all the enquiries I’ve had have come from there .. and many thanks to those who’ve contributed information! If I find out anything useful for other regions I’ll include it here. An absolutely wonderful article! I am in the U.S. and will check on what you have posted for our possible use. I am really “into” Medieval Castles and this article will be very helpful for me! Thank you for a well written article! Old I know but why would this not work with 1/12 scale? Because even at 1:25 layers have to be built up to achieve believable thickness, so at 1:12 it would just need too many. Glad it helps! The newer versions of ‘stencil card’ are not as good, but still work fairly well for this effect. Hi David, thanks a ton for this fantastic article. I’m from India and I searched on Amazon for oil boards, oiled manila, stencil card, stencil paper, stencil board but nothing seems to provide the required result. Can you help? Would you possibly know if it’s called something different in India? Can’t help I’m afraid, but the chandelier drawing is in ‘Template drawings for furniture’ in the Methods section. Thanks! The lighter honey-coloured one strengthened with proper linseed oil is disappearing now, replaced by a darker, slightly thicker version. This will still work, but not as well. You may find it in searches still as ‘oiled manilla’ or ‘stencil board’, ‘stencil card’ or maybe ‘oilboard’. Beautiful work! Would you kindly share your drawings so I could try this technique? Thank you! Yes, they’re all in ‘Template drawings for furniture model-making’ in the ‘Methods’ section. Hi Ditta, I’ll send it .. but I’m going to be putting this drawing and others in a properly scaled form on the site soon. Look out for the post! These are fantastic! I just recently rediscovered a doll house kit I bought more than 20 years ago and am making plans to put it together, finally! Accumulating furniture and other fun things is a big part of that, of course. But, making things is the way to go! I would love to have the plans for your furniture and chandelier!!! I do have a Silhouette Cameo cutting machine and it can cut light chipboard. I’m hoping that will be sufficient. If not, I think that layering will work. I love it when creatives share their how-two! Thank you so very much! Thank you for your generous sharing of your skills and information. I would love to have the two chair templates and the chandelier, and the cupboards if that is not being too greedy. My grandson loves to play in the doll house in his kindergarten class, so I bought a plastic one that needs furniture. But I am hopeful I can use this material for display sets for my jewellery business as well. Thank you again for being a generous artist who likes to share his knowledge! Hi, incredible how you do it.! My daughter has to make a miniature house and furniture for a project at school. Could you help us with some templates of furniture, please? Bruno, apologies for the delay .. you can thank Virgin Media UK for leaving me (and others where I live) without broadband since the beginning of the week! I will send the drawings shortly. I just found your site and I am in awe. I was wondering if it were possible to receive a stencil, I just started trying to make dioramas. may I have the templates for the French chair and the chandelier, as well, please? Loving the elegant simplicity and can’t wait to try them out! So far, your wonderful blog has been a real eye opener for me – entry after entry I’m completely changing my whole approach to building my niece’s dollhouse, so you’re really helping out a lot in making it go from looking childish und improvised to more or less bequeath-worthy :o) Thank you so much for the shared thoughts and passion! Glad it’s been so helpful! I’ll send the drawings. Out of interest .. what materials are you using? Unfortunately I haven’t been able to find any stencil board material in my local shops, so up to now I’m powerglueing thin wood and/or cardboard sheets. Really hoping to find some oiled manilla though, since it would simplify the building process immensely and the furniture seems to look much sleeker and refined this way. Are you certain? .. have you looked using the terms ‘oelkarton’ or perhaps ‘schablonenkarton’? Could you send me the templates of chairs, table and chandelier? I would use cardboard for this work. Hi, will send you by email. I just sent it .. no problem. Hi Mr Neat , I’m currently working on my school project which is to make a restarurant model,and i found your website.I find it helpful ! Would you mind to send me the templates for chairs, table and chandelier.Thank you so much ! No problem, I’ll send you by email. I am so impressed with your models of the chairs and for writing and sharing such a detailed article. 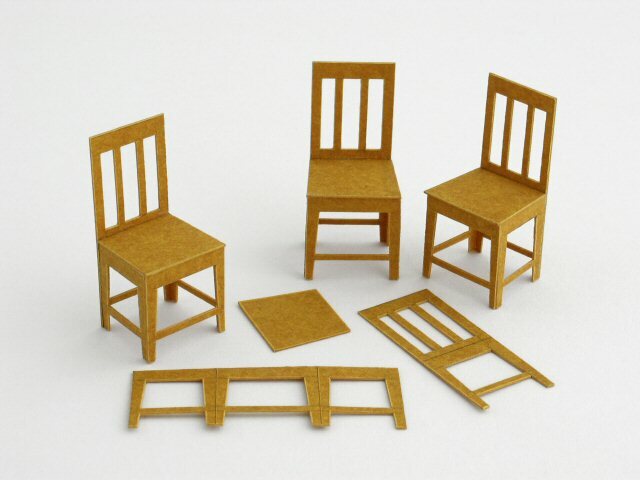 I’ve never seen miniature chairs built like yours before. I’ve just recently started building chairs for my daughter’s doll house, but those require cutting and gluing individual pieces together (talk about time consuming). Do you mind sharing your template with me? 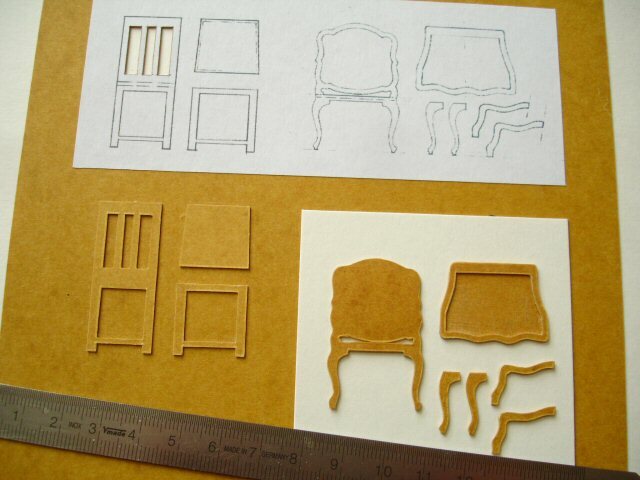 I would like to experiment with different styles of chairs for her dollhouse. Thanks so much. I’ve been building models for 7 years now as a student in NYC but can’t get over how clean your models are. I would love to make a variation of your chairs and chandelier. What scale did you make them in? Would you mind sending me your templates to get started with? I’ll send them to you. Hello David–Your excellent tutorials are works of art in themselves. I’ve made a few chairs and tables for my miniatures using your techniques and am so thankful for learning them. I noticed from above you have been quite generous sharing the template for your chandelier and chair(s). Will you grant me the same favor in 2015? No problem, have sent you an email. Hi! I would be interested in these templates too. 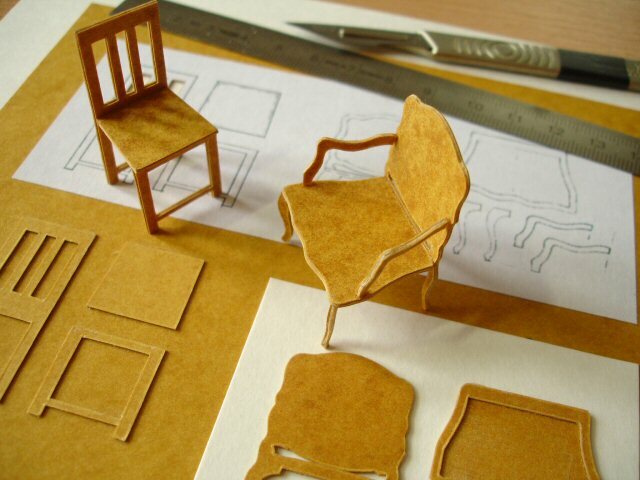 I love your tutorials too, they actually saved my dollhouse furniture from being plastic ones!! No problem .. have sent to your email address. Yo recién empiezo con esté mundo de las miniaturas , así que cualquier información la agradezco . Gracias, se encuentra este sitio útil! Thank you so much for these tips! I’ve just ordered some of the stencil card, would it be possible for you to send me the drawing of the chairs and chandelier? No problem, I’ve sent you these. Use them as a guide .. but develop your own versions, and I’d be interested to see them! Muito obrigado por compartilhar !!!! Você poderia compartilhar a impressão? I have just come across your interesting article on a completely alternative use for stencil oil board. We have been converting and distributing this material for over 50 years as a consumable for the stencil cutting machines and marking inks that we sell. Our market has always been the packaging industry but with the huge decline in manufacturing and export this market has reduced enormously to the point where we are only selling maybe 10% of our former volumes of oil board. We have usually supplied the material in packs of 100 sheets at 560 x 170mm as this is the size suitable for the machines, although some use 810 x 280mm. It is all cut from full sheets at 1000 x 560 mm. 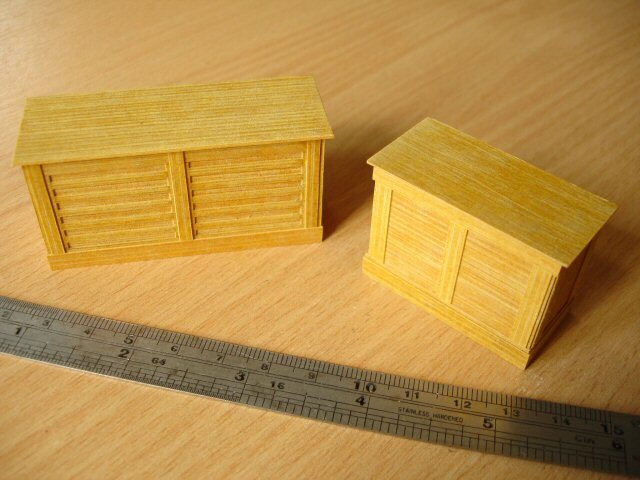 We probably scrap off-cut material in larger volumes than the whole model making market would require but regrettably we are not geared up to supplying small low value orders – but let us know if you need off-cuts. Thanks so much for taking the time .. it’s great to hear from a supplier! I’d dearly like to take you up on your offer of off-cuts! I teach in so many places and usually bring my own off-cuts since only very small pieces are required .. but my stock of these is becoming very small! I’m thinking on how we might be able to help each other! .. although, as you say, the model-making market as it is would not amount to much return. Mr. Neat. Think your designs are amazing. I had never heard of this material, but I am looking forward to giving it a try. I would like to replicate these for a project I am working on for my kids. If there is any way that you could share your drawings of the chandelier and the arm chair, I would be so thankful. Thanks Belinda! Just to confirm .. I’ve sent you an email with the files. I’ve sent you the drawing by email. Just love it, and I’ll try it soon. I can send it to you but it’s not to scale .. you’ll have to resize it. These chandeliers are on average about 1metre in diameter. I’ll send it as soon as I find it again. ¡Es un material increible, que no conocía!. Gracias por las direcciones de UK. Aquí en España no sé donde encontrarlo, asi que intentaré conseguirlo allí…El resultado de tu trabajo es fabuloso.¿Tienes las plantillas de las piezas de la lámpara? Te quedaría muy agradecida si pudieses enviármelas para intentar hacerla. ¡es preciosa! Sí,eso no es problema! Te enviaremos el dibujo por correo electrónico tan pronto como me parece. Thank you, yes I designed the shape. I just have a scanned pencil drawing, which I’ll send to you. SO happy to have come across your blog through this post on Pinterest. This stencil board looks intriguing, I’ll have to try to track some down here in Australia. Maybe it’s known as ‘oil board’ in Australia too, as in the US? So impressive! I have worked with various types of heavy white card stock for years, and have created several kits in that time that have components that have been diecut to the shapes needed. The diecutting seemed to eliminate the “furring” of cut edges. What you have been discovering about the use for this “oiled board” material intrigues me. I’m not about to start designing kits again, but I would certainly like to try using this material. I smiled when I read your descriptions of using various shoe polishes for “staining”, because I have used them for years and agree that they are very “usable” and easy. Your directions and photos are very well done. Many thanks Dureen! I’ve been finding out more about the stencil card we have here in the Uk. I’d always assumed it was produced as an art/craft material but I’m beginning to realise it’s another of those things that has become appropriated by the art/craft market but ‘makes its living’ elsewhere. Machine-cut stencils are still used, particularly in the shipping industry, for quick tagging of goods and oilboard is produced mainly for this purpose. The oil in this case not only protects the stencils from water-based sprays but acts as a lubricant for the stencilling machines .. or so I understand. To others in the USA, here are two places where this material can be ordered by the individual sheet. Great! This certainly looks, if not exactly the same, near enough..!.. and hopefully with the same properties. I’ve been busy and couldn’t look in to see your previous message but I’m writing a post to spread this info because I’ve had a number of enquiries. Thanks for sharing this! I checked with one of the miniature forums I belong to (SmallStuff). David, does this look right to you? No I’m afraid I don’t. I wasn’t aware until now that it isn’t just as familiar there as here in the UK. I did a search of US sites using all the names I’m aware of .. stencil card, stencil paper and oiled manilla .. and nothing, nothing at all! That’s really surprising since it’s quite a traditional, established material. All I can suggest is that you contact the supplier here that sells it by far the cheapest, Wrights of Lymm info@wrightsoflymm.co.uk and see whether they will ship. Failing that 4D modelshop in London http://www.modelshop.co.uk may be more used to international orders. I stumbled on your website through Pinterest and am really intrigued by the possibilities of stencil card. Do you know if it’is available in the United States and if it might be sold by another name here. So far my internet search only showed sources in the UK. Is 5 pounds per sheet a decent price? See my reply to the neighbouring, similar question. I’m ‘flabbered’ that the US seems to be a total stranger to it! .. and, yes Cindy, £5 per sheet is a pretty indecent price! Wrights of Lymm sell it for £1.55 for a large sheet. Yvonne, sorry about the long delay! See my answer to Denise. Try Wrights of Lymm or the 4D modelshop. F-A-B-U-L-O-U-S! I love making card models and this is a wonderful article!